This Stunning and unique revolver was designed and engraved for Dennis Adler. An Award-winning Author and avid collector of American West and Civil War firearms. Bold floral scroll, Fleurs-de-lis borders and fine shaded leaves creating a French period engraving style. Finished in Black Nickel to high light the engraving giving it a antique feel. 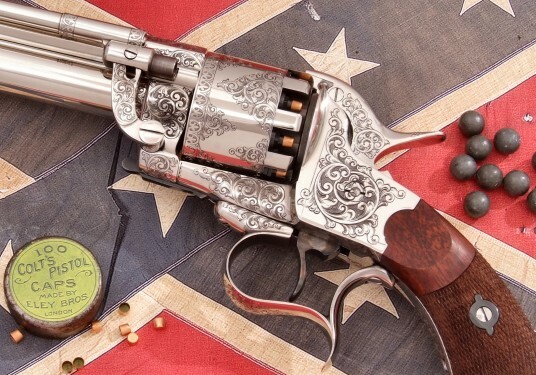 The Souths Legendary Le Mat featured in Guns of the Old West Magazine Spring 2012 Edition. An artist Tribute to an Historic period of American History.